A mindwalker is in hiding on the edge of the Sigma Sector, where the Fleet are still a rumour. Flesh body. Forty. File clerk. Space station. Planet Nigel. Sigma Sector: every morning Victor Gomenzi has to remind himself who he is, where he is – and what he is. Victor Gomenzi is a mindwalker. On the run from Sigma agents, Gomenzi is hiding out on Nigel, tenth rate industrial colony world culturally disconnected from the Sigma Sector. He works on Nigel’s space station as an official spy for the government, extracting data for the vice president using the standard procedure. He tries not to mindwalk too much, but it’s hard to resist. On twelve Sigma planets laws have been passed against mindwalking – yet mindwalkers are a myth, like vampires. Meanwhile, in the Church of SPIT, priests study the doctrines given to them by the Fleet. No one has met the Fleet. No one knows who they are. Except Gomenzi. Always on the prowl, he destroys the lives of everyone around him: ex-wife and brilliant scientist Aster; shy and virginal girlfriend Tess; snack-munching workmate Tidman; insanely ambitious boss Admiral Grote. And countless others on the space station whose minds he rips apart in order to experience an emotion. Any emotion will do. He wants nothing more than to go home to Dirtball – Earth. But his twin brother Vincent is after him and Vincent works for the Fleet. 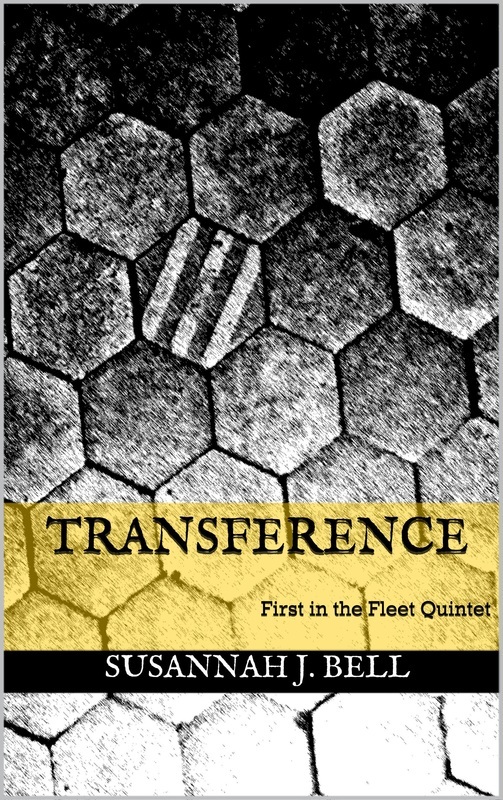 The first novel in the Fleet Quintet, TRANSFERENCE enters the psyche of a ruthless mindwalker. You’d expect to find brilliantly imaginative technology in your average sci-fi novel. For some futurist authors, inventing new hardware is probably half the fun. With TRANSFERENCE, I went in the opposite direction: the computers are laughable, like something out of the 1980’s. There’s no internet but they are networked, the way I dimly remember them in the late eighties, except much worse. As for communications: you have to book any calls you might want to make through an operator (when was the last time we did this? The fifties?!) and the call could take hours to go through. Callers wear headsets and can see each other on phone screens but otherwise, the phone network is appalling. It’s also very funny and central to the plot. Despite having an enormous space station used as a refuel stop for ships heading to more technologically advanced planets, the tech on backward Nigel feels purposefully restricted. Androids are built to do the dirty work but have no intelligence. And a trillion miles away, somewhere on Earth, someone is still using a Bakelite phone and one of those answering machines with a tape. All this has a great comic effect but the novel itself is actually quite dark. This novel started life as a rather long short story with another short story as a sequel. Much later, when I became A Professional Writer (if there is such a thing), the short stories, called Access Denied and Baby Doll, were turned into my second screenplay. It was at this point that I realised I wasn’t a screenwriter – I wanted to write pages and pages about the characters and the background which you can’t do in a pared-down script. I also wanted to get inside the heads of my characters and rummage around – rather like a mindwalker. So Gomenzi found himself at last inside a novel, at the time the second in the Fleet Quintet. For various reasons, it’s now the first and despite working on it again and again, really trying to improve the words on the page, the story, the characters, it still feels to me like a first novel. Thinking about it, it actually is my first novel (not counting the garbage I wrote before becoming A Professional). Ultra was published first but it was written much later. There is a lot about this novel that doesn’t work: it jerks the reader’s attention in too many directions. It’s clunky. It’s patchy. It’s too long. The purposefully stereotypical minor characters just seem, well, stereotypical. Despite these flaws, I think it remains an entertaining novel and Gomenzi himself has never become stereotyped. Gomenzi killed a cigarette and stood up, set to go to work. He had an appointment at two the next morning, another recommendation. The port was busy. A number of tourist vehicles stood ready to leave. He had watched one being towed off the landing floor with engine trouble. A whole shipload of tourists would be not leaving for a week. The Food Sector danced around its sub-food burgers with glee. There was nothing to do on the station except eat and watch dull Nigel go round and round. The restaurants and bars were going to make a fortune. Gomenzi did not give them much thought as he left the coffee lounge, pulling on his coat and checking his pockets for his key cards. He did not notice a figure detach itself from a wall, eyes tracking him as he headed for an elevator platform.